I was disturbed by the quotation from Alberto Mora’s [’74] honorary degree talk (“Collection,” July Bulletin: “No one educated here could fail to recognize that a person’s right to be free from cruel treatment is a fundamental human right….”). 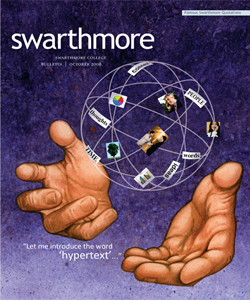 Mora adopts an “all-of-us-here” mentality, whereby he assures his audience that no one who attended Swarthmore could be thought capable of torture or of condoning torture. Alberto was a classmate, and I have seen his name in the news—and his brave defense of human rights. I highly applaud his acts and his integrity, but I must object when he places all Swarthmoreans, by definition, on such high moral ground. I object empirically, having been present at a post-9/11 rally at Swarthmore, where I heard the sneering, loud voices of students berating their anti-war critics as softies—and demanding global war by all means necessary. And I object on philosophical and psychological grounds, because it seems to me a form of bad faith to wreathe all Swarthmoreans with a glow of moral purity while locating the evils that led to Abu Ghraib and Guántanamo exclusively in the philosophies and psychologies of others. In my opinion, the Quaker morality that underpins and pervades Swarthmore is dangerously elitist and lacking in self-criticism. Maybe “we” don’t torture (don’t be certain of that! ), but, like the Quaker owners of the Pequod, we’ve profited while madmen and workers paid by our tax dollars kill and pursue their own white whales on the other side of the world. This is not a time for self-congratulation but for deep and serious self-criticism.